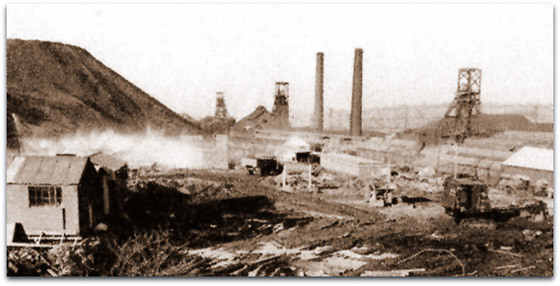 On 30th June 1974, Glapwell colliery (North Derbyshire) sunk in 1882-1884 by the Sheepbridge Coal and Iron Co at Bramley Vale was closed after 90 years. Referred to as No1 and No3 pits. A new village was built opposite for the workforce. Highest manpower under Sheepbridge Coal and Iron Co was 3,273 in 1930, and under NCB 3,060 in 1949, and highest output was 1,101,370 tons in 1967-68. 12 Lancashire boilers were used to raise steam for winding. No1 DC shaft, 366 feet (111.55m) above sea level, 43/4666/702335 at 14 ft (4.27m) dia was originally sunk to the Top Hard at 287 yards (262m), 379 yards (346.5m) to sump and there was 100 yards (91m) of cast iron tubbing in the shaft to hold back the water. The winding engine had 2 horizontal cylinders 36” (0.91m) x 6’ 0” (1.83m) stroke, parallel drum 16’ 0” (4.87m) x 9’ 0” (2.74m) wide. No2 UC shaft, surface level 354 feet (107.9m) above sea level, SK/4666/576874, winder had 2 horizontal cylinders 30” (0.76m) x 5’ 6” (1.68m) stroke. Conical drum 12’ 0” (3.66m) to 14’ 0” (4.27m) dia. Waddle fan 40ft (12m) dia, at 50 revs per minute, King speed recorder. Endless rope engine on surface, horizontal cylinder 26” (0.66m) x 3’ 0” (0.91m) stroke geared to 10 to 1, driving wheel 9’ 6” (2.90m) dia and an horizontal engine with 26” (0.66m) x 3’ 0” (0.91m) geared 7 ½ to 1 with a driving wheel 7’ 0” (2.13m) dia, both engines used for the main dips haulage roadways. A horizontal engine with 2 cylinders 16” (0.40m) x 3’ 0” (0.91m) dia geared 8.8 to 1 with a driving wheel 7’ 0” (2.13m) dia was used for the Hardwick engine plane on the south side of the colliery. The haulage rope on the main dip haulages lay on top of the tubs and under the tubs on the level haulage roads. 30 men and boys were employed picking and cleaning cannel coal on the screens. Gas manufactured at the colliery was used to light the surface and was forced underground to light pit bottom and pit bottom stables. Pit ponies were also kept in inbye stables in the Top Hard. The seam was worked on the longwall stall system. No3 shaft 333 feet (101.5m) above sea level, 43/4666/576814, 503 yards (460m) to sump. As noted by John H Rippon, Geologist, the manriding shaft to Tupton (Low Main) was one of the few in North Derbyshire that had a gridded floor that could be looked through, allowing the lights of the pit bottom to be seen as a pinprick to start with, rapidly getting larger as the cage descended. 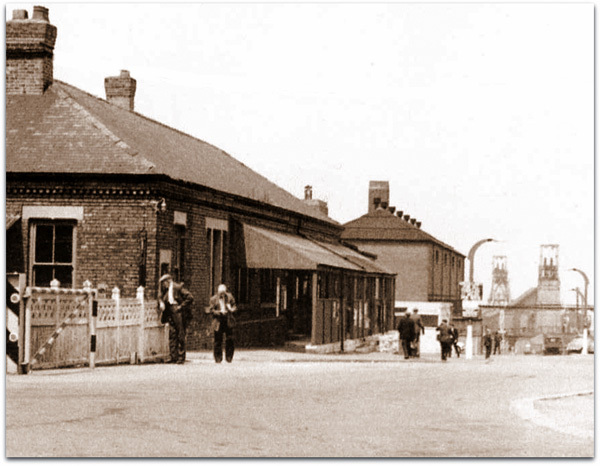 Pithead baths were opened in 1932. Underground locos: 2’ 0” gauge 2 x 4WDMF 8DLGs, 149 and 1955. The Top Hard seam was worked on longwall advancing stall system from 1884 then panels 1930s until 23/9/1943, exhaustion, using 4 tubs at 10 cwts on the cage. There was a steam engine on the pit top for underground haulage work eventually pulling up a 1,300 yards (1,190m) plane dipping at 10” to a yard (1in3.6 max). 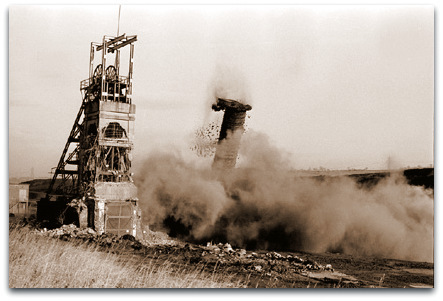 Blackshale restart, coal 2’ 8” (0.81m), dirt 2” (0.05m), coal 1’ 2” (0.35m) 1970-26/4/1974. Poor conditions in the Blackshale seam were blamed for its demise. The 158 yards (144.5m) deep Ramcroft shafts 43/457937 675279, 43/4578327 6752343 had been undermined in this seam during Dec 1972-Jan 1973.Glapwell No3 shaft SK/4666/514752 at 18 ft (5.49m) dia was sunk to 654 yards (598m). There were connections to Langwith and Ramcroft at Top Hard horizon. Water migrated into Glapwell from these pits. A borehole was drilled into the Dunsil seam workings at Teversal from the Waterloo during the 1950s and proved the workings were dry. The Clowne seam at 2’ 4” (0.71m) thick with 4” (0.1m) black bat overlying worked from the Bramley Vale drift mine was isolated from the Glapwell mine, but later was managed by the Glapwell team. Working began in 1955 and finished 31/1/1970. No1 drift adit co-ords 43/4666/702335, length 1,138 yards (1,040m) at 1in5 and No2 adit 43/4666/771453, length 1,140 yards (1,042m) at 1in5. Both drifts were driven by NCB personnel on contract. No3 adit position 43/4666/576814, length 503 yards (460m) driven almost due north at 1in4.3. A cover line of 50 yards (45m) of strata had to be left to the surface, also a pillar under Carr Vale. 3 Opencast workings crossing the site of the M1 motorway were to the North West and South East and a band of alluvium deposits either side of the River Doe Lea which crosses the area. New pithead baths opened 1961. A planing machine was introduced at a gate end in 1967. In 1969 a Muschamp remote haulage shearer with a 32” (0.81m) disc was installed in the 33” (0.84m) thick Clowne seam. The North Derbyshire information store room was based at Glapwell from 1975 and the Area sign shop for all notices from 1977. The photo to the left shows demolition of the colliery. 1974/75: 40,122 tons, 237 men. Production ceased June 1974. Ronnie CH Hamilton (4441) 1974 for closure. Phil Goodwin (8917) 1973-74 (transferred to Bolsover). Jim McGuigan (5965) (previously at Warsop). Harry Cossey (….) (ex Staffs Area) 1974. 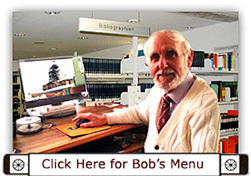 Bob Hudson (transferred to Manager Area Salvage team). John E Hancock (6205) (transferred from Oxcroft, transferred to Langwith). Jim Ferreday (7684) 1962-1967 (promoted to Deputy Manager). Jack H Milner (1811) Jan 1968-1974.